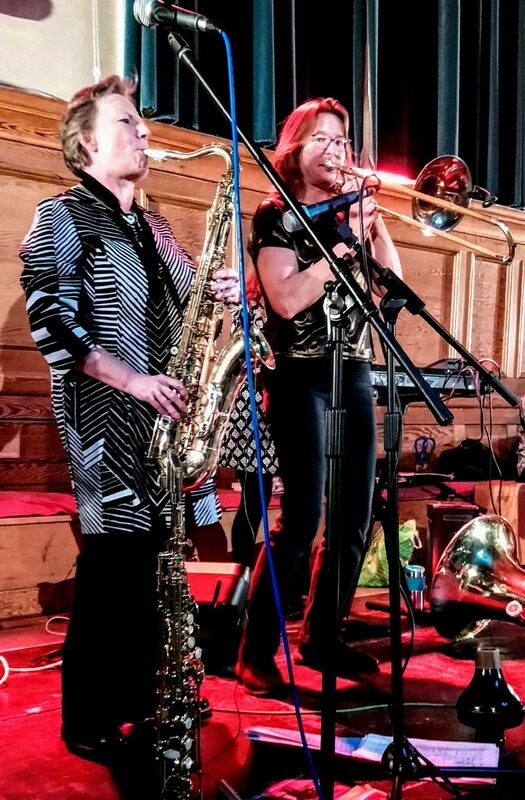 Jo and Alice from Token Women blow their instruments. Celebrating the band's 30th anniversary - scary as I remember them forming. Named because at the time, they were all 'token women' in all-male bands. Another blustery day and the campaign, phew, finally went live. I worked from home, busy with clearing emails and dealing with a heck of a lot of new ones. Stopped for a lunch of mozzarella and avocado salad Dave's appointment to get the injection in his other hand came through - for late April. Once Dave got home he had a bit of a rest, and I cooked up a big pot of tuna pasta. Drove to the Token Women ceilidh which was excellent. L, P and R joined us - L still having ridiculous issues at work. Also Sian and Teressa but no Kevin as he's working in China. Miraculously, the knee managed okay though I took care not to leap about too much. The most terrible terrorist attack on 2 mosques in Christchurch dominated the news today.